Do you like gula Melaka sago pudding? 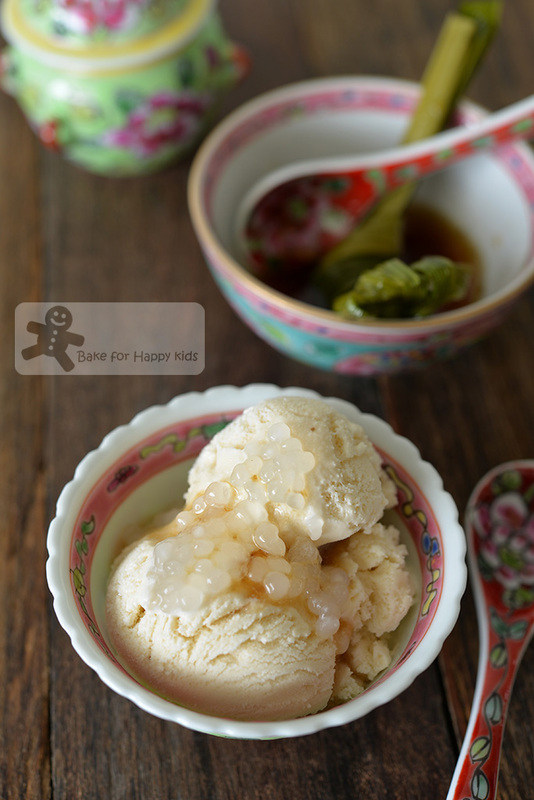 I have a nice and easy recipe at here... but if you like gula Melaka sago and ice cream, I'm guessing that you might like this gula Melaka ice cream too. Instead of making a rich coconut ice cream with coconut cream and egg yolks with no milk (like the Poh's Pandan and Coconut Ice Cream - which I could), I have made a lighter version of gula Melaka coconut ice cream with light coconut and milk.... All because I prefer something less jelak (meaning rich food in Malay) and yet satisfying with flavours. "Mum, your ice cream is too icy!!!" Despite my fussy son can detect that I have altered the richness of this ice cream and complained about it, he still enjoy this ice cream without feeling too full consuming excessive sugar and fat. "I actually prefer this light coconut ice cream..." said my husband who has becoming more health conscious these days. "Me too!" Glad that I'm not the only one who thinks that this ice cream is better than the one being fully loaded with fat. Looking on the brighter side, I think that eating this finely-icy gula Melaka ice cream is like eating a fusion of ice kachang plus gula Melaka sago pudding. Pretty satisfying actually. I'm using a combination of cream and light version of coconut milk here. 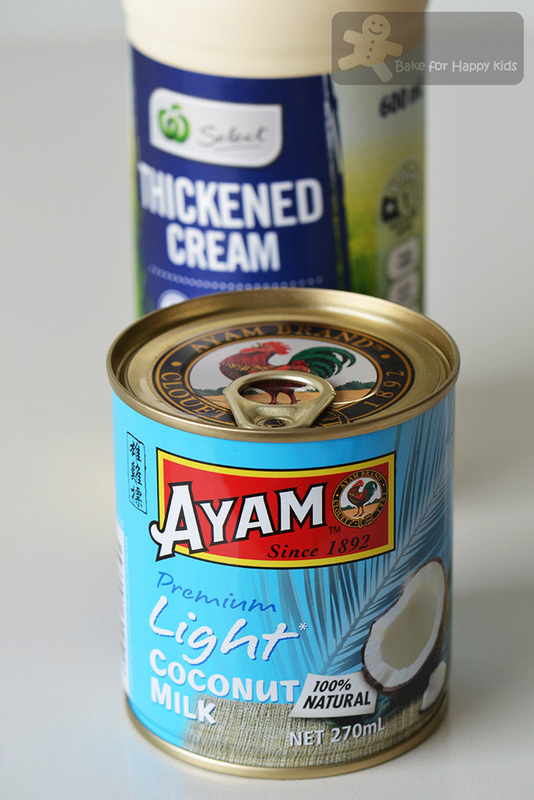 The light coconut milk contains 13.4g/100g fat wheras the regular coconut milk contains 24.3g /100g fat. To start, I combined pandan leaves, 1/2 cup milk and gula Melaka in a saucepan. And bring mixture to boil. Mixture will look curdled and it's ok! Mixture will mix well into other ingredients eventually. Whisk eggs (or egg powder plus water) and caster sugar until light and frothy. When the ice cream mixture is well chilled, pour it into an ice cream maker to churn. While chilling the mixture, cook gula Melaka syrup. And also cook adequate sago to serve. Chill the gula Melaka syrup and sago (separately) in the fridge while waiting for the ice cream to be ready. Now we are enjoying our gula Melaka ice cream with sago and drizzles of gula Meleka syrup. Here's my lighter version of Poh's Pandan and Coconut Ice Cream, adapted by fusing it with Ben and Jerry Ice Cream Basic Recipe that we always like. * If fresh pandan leaves are not available, you can use 1/4 tsp pandan extract or 1/2 tsp essence instead. ** I would highly recommend using pasteurised egg powder to avoid any food contamination due to the use of raw eggs. 2. increase the amount of gula Melaka from 50g to 100g. The increase amount of sugar will make the ice cream mixture more viscous but we reckon that 50g is just right for us. 4. use 100g caster sugar instead of 50g. The increase amount of sugar will make the ice cream mixture more viscous but we reckon that 50g is just right for us. 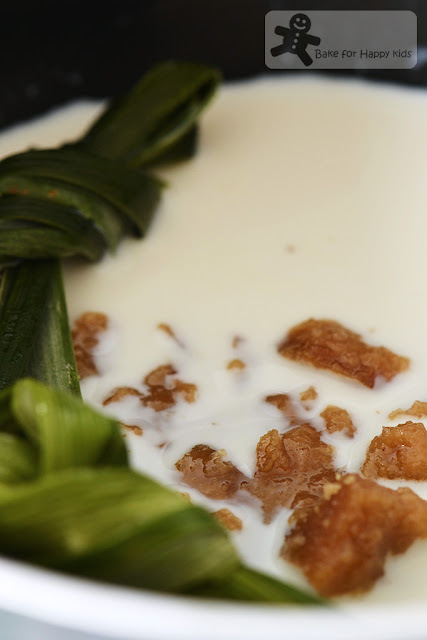 Combine pandan leaves, 1/2 cup milk (or cream) in gula Melaka in a medium saucepan. Using a medium heat, stir until gula Melaka is dissolved. Then increase the heat to bring mixture to boil. Remove from heat and allow mixture to cool to room temperature. It's ok if the mixture looks curdled. Not to worry if it will mix well into other ingredients eventually. Meanwhile, whisk the eggs (plus water if you are using egg powder) (or egg yolks) in a mixing bowl until light and frothy, 1-2 mins. 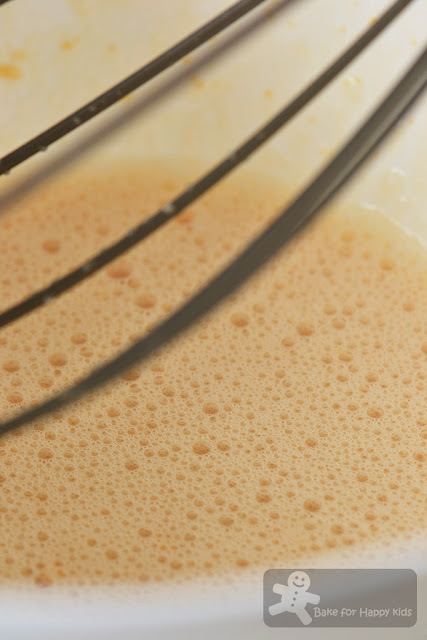 Whisk in caster sugar, a little at a time, then continue whisking until completely blended, about 1 min more. 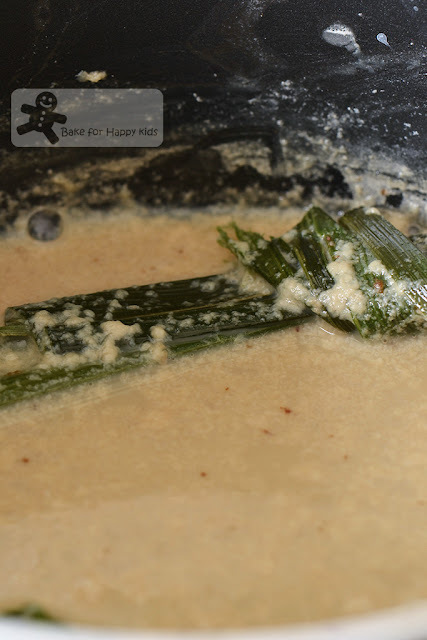 Add cream, coconut milk, salt, the remaining milk (or cream) and gula Melaka mixture and whisk well to blend. Transfer mixture into a container with cover. Cover and refrigerate until mixture is cold enough to churn (at least 3 hrs). 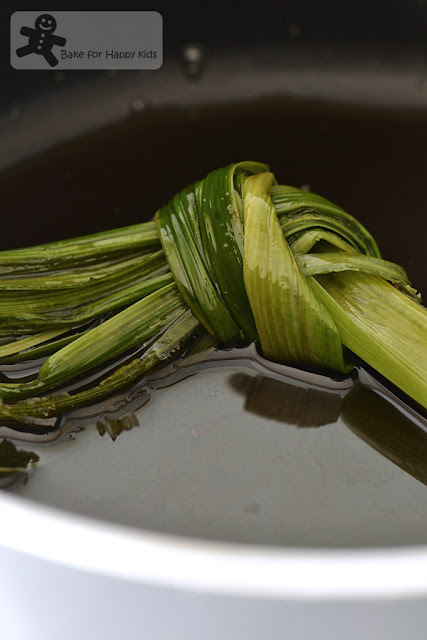 Do not discard the pandan leaves so that the flavours can infuse into the mixture while chilling. While waiting for the mixture to chill, bring gula Melaka, pandan leaves and water to boil and cook until the sugar is completely dissolved. Add salt and remove from heat. Allow the syrup to cool completely at room temperature. Transfer mixture into a container with cover. Cover and refrigerate until the syrup is well chilled. Do not discard the pandan leaves so that the flavours can infuse into the mixture while chilling. 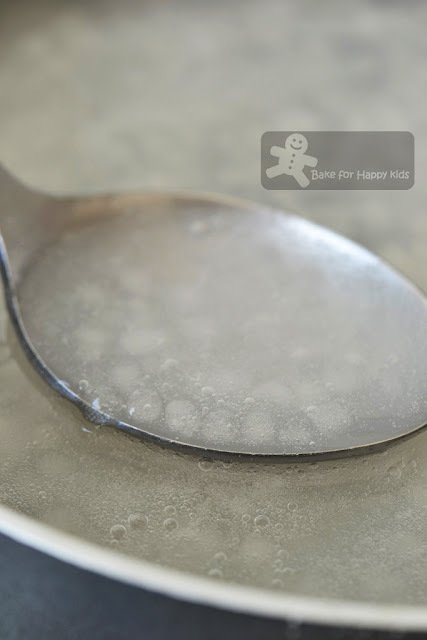 To cook the sago: fill a medium pot with adequate water. Add a pinch of salt (optional) and bring the water to boil. Add sago and cook for 10-15 mins and it is ok if they are not completely transparent. Remove from heat and allow sago to rest in the hot water with a cover for about 10-15 mins. At this point, you will see that the sago are transparent. Pour through a sieve to drain excess water. Transfer sago in a container with cover and stir in adequate water to prevent the sago from sticking to each other. Chill sago mixture completely in the fridge while waiting to churn the ice cream. 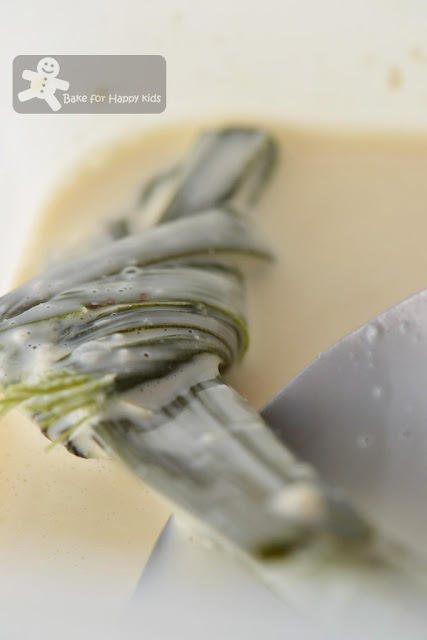 When the mixture is completely chilled, squeeze mixture out of pandan and discard the leaves. 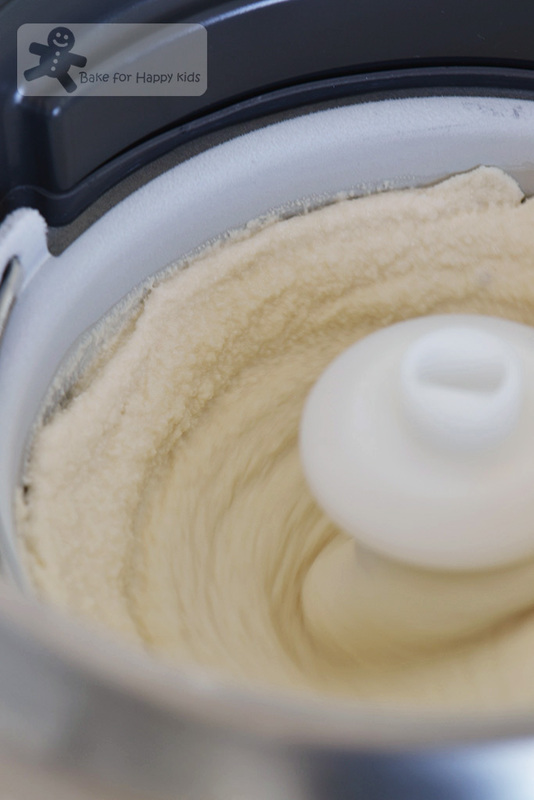 Transfer the mixture to an ice cream maker and freeze following the manufacturer's instructions. Then transfer into an airtight container to set in the freezer overnight before serving. If you think that ice cream is too icy, you can microwave the ice cream for about 10-15 sec to soften it a little as the softening will enhance its creamy texture. Serve with gula Melaka syrup and spoonfuls of sago if desired. 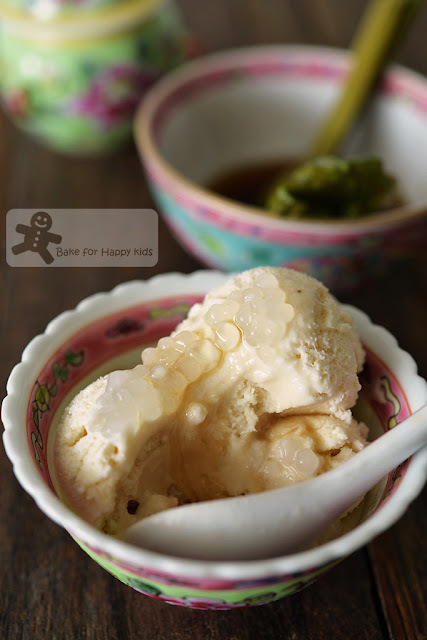 I reckon that this Southeast Asian flavoured ice cream is a beautiful dessert to serve for Chinese New Year celebrations and would like to link this post at Cook and Celebrate: Chinese New Year 2016 hosted by Yen from GoodyFoodies, Diana from The Domestic Goddess Wannabe and Zoe from Bake for Happy Kids at here. Wah, after gula Melaka sago, now gula Melaka ice-cream.. I'm hoping for gula Melaka candy next, haha.. The coconut+gula Melaka taste sweet, wrapped in colourful plain wrappers, like a bolster? Wah, that one I heart !! Your ice cream looks divine! Love the idea of the gula melaka syrup and the sago! Pass me a big bowl of your ice cream with a generous topping please! Yummilicious! Oh Zoe, you present the most innovative delights! I've been going light on most meals these days! I sure wish I could taste this refreshing ice cream! Zoe this Ice cream look delicious !! yummmm, love gula melaka and the combination of pandan and coconut milk is always a winner. YUMMY! I'll never tire of gula melaka products...I love the smell, the earthiness and I really am craving some gula melaka cake right now! 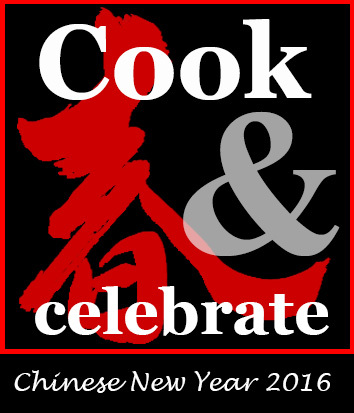 Happy Chop Goh Mei to you & family ! Oh my, I am salivating and gula melaka sounds terrific. Enjoy & have a great day ! i can't make the ice-cream ): it become so watery.. but taste good. 1. The final of ice-cream mixture is like creamy or watery ? 1. This ice cream mixture is rather thin when it is in room temperature but due to its fat content, it will thicken slightly when it is chilled. 2. So sorry that this chilling step is essential especially if you are trying to churn this ice cream in a warm weather. Hi Sharon, I'm using egg powder in this recipe which has been pasteurised and so I don't have to cook the egg. I don't prefer to cook the eggs in most of ice cream recipes because it will alter the ice cream to have unpleasant cooked eggy taste and prefer not to use raw eggs due to food safety reasons. Cheers!